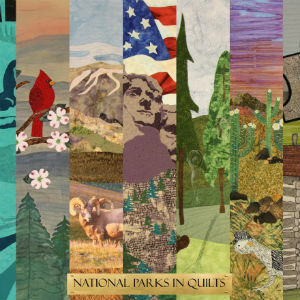 Shenandoah National Park is displaying 13 art quilts created to celebrate the centennial of the National Park Service from October 4 through October 24 at Dickey Ridge Visitor Center (mile 4.6 Skyline Drive). The quilts were created by Fiber Works, a group of textile artists from the Lincoln-Omaha, Nebraska area. The artists were inspired by their favorite national park site. The quilts are on a year-long tour of the 13 chosen parks. “The National Park system is a gift to all Americans. For one hundred years places of historical significance, structures of great merit and many of the natural wonders of our country have been preserved and protected. The National Park system is a symbol of what it means to be an American. We each felt moved by our chosen park or monument to design a piece of fiber art to represent it. We hope others will enjoy viewing the pieces we have created from our hearts” stated Cynthia Levis of Fiber Works. Parks on the tour include, in order of exhibition, Homestead National Monument of America in Nebraska, Joshua Tree National Park in California, Saguaro National Park in Arizona, Hawaii Volcanoes National Park in Hawaii, Statue of Liberty National Monument in New York, Wolf Trap National Park for the Performing Arts in Virginia, Wind Cave National Park in South Dakota, Mount Rushmore National Memorial in South Dakota, Glacier National Park in Montana, Rocky Mountain National Park in Colorado, Shenandoah National Park in Virginia, Everglades National Park in Florida, and Jefferson National Expansion Memorial in Missouri. The schedule for this exhibition can be found on the www.nps.gov/home/centennialquilts. Quilt enthusiasts and all visitors will be able to Find Your Parkthrough this unique exhibit. Art quilting incorporates modern and traditional quilting techniques. The artist may use many different processes to create their artwork, including painting, dyeing, stamping, piecing, collage, printing (often incorporating a photograph printed onto fabric), applique, and other complex cloth processes. Inspiration is the key. “Shenandoah National Park is honored to have inspired one of these creations,” said Superintendent Jim Northup. Dickey Ridge Visitor Center is open from 8:30 a.m. to 5:00 p.m. (Sunday-Thursday) and from 8:30 a.m. to 6:00 p.m. (Friday/Saturday) until October 29. From October 30th through November 27th the visitor center is open from 8:30 a.m. to 5:00 p.m.daily. It will be closed on Thanksgiving Day, November 24th.